A video released by Los Angeles police Monday shows a suspect shooting at an officer from inches away and police returning fire, fatally injuring the man. The shooting occurred after a traffic stop on July 27 in North Hills, police say. It involved two officers — a female who was shot and a male who returned fire, fatally wounding the suspect. 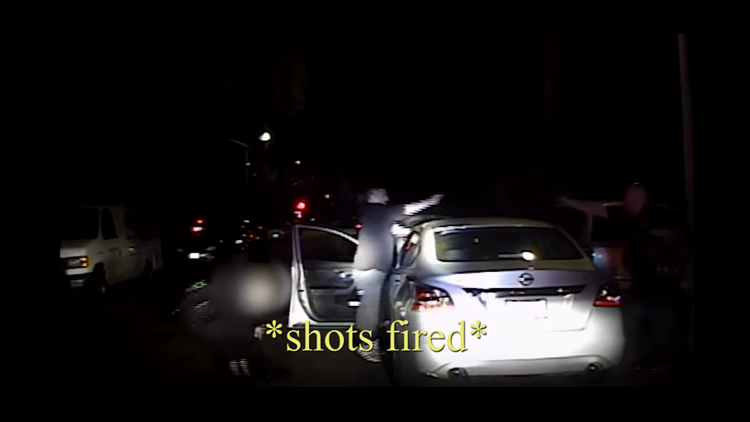 An edited video shows multiple views of the incident, including dash and body cam footage. The video shows that police pulled over a suspect and that officers approached his vehicle from both sides. A female officer on the driver's side briefly converses with the suspect, asking him to exit the vehicle. As the suspect leaves the car, he pulls a gun, shooting the female officer at close range. The video shows a blur of motion as the gunman turns his gun towards the male officer, who shoots the suspect multiple times. The gunman, identified by police as 32-year-old Richard Mendoza, was shot in the head and torso. After receiving treatment, he died at a later date, police say. The female officer has not been identified and received treatment for a gunshot wound to her left leg. “By the grace of God she is alive,” LAPD chief Michel Moore told the Los Angeles Times. “Officers are fearful in these situations and the public here gets to see why." Moore said that the quick action of the male officer saved both officers' lives. Moore told the publication that the female officer knew Mendoza from her work in LAPD's gang unit. Mendoza went by the name of "Biz" and was a known member of a street gang, police say. Before the shooting in the video, the female officer can be heard asking Mendoza if he was still on probation — he responded that he had nine months left. One video angle appears to show that until the moment of the shooting, Mendoza had both hands raised. "You don't have anything on you, right?" the female officer asked before the incident. After the shooting, the male officer is shown rushing to the aid of the female officer, who was crying out. "Just get him," the female officer tells the male officer. The male officer approaches the fallen and bloodied suspect and handcuffs him. Police say that action was for the safety of the officers. The LAPD is reviewing the shooting. A video statement says the investigation will take several months.